Kids Rock Broadway at the NAC! Sometimes, being a kid can be tough. Between balancing school and home life and trying to navigate their way through childhood into adolescence, there isn’t much time to just sit and enjoy being a kid. Now imagine on top of all those things; having to learn a script, memorize a song list, and play a set in front of a live audience night after night…. Well, the kids of SCHOOL OF ROCK’s North American touring cast make it look easy. The process of finding the perfect kids for the cast, on the other hand, is anything but. For the initial production of SCHOOL OF ROCK, which opened on Broadway in 2015, the casting team looked at a total of 22,000 kids around the US. Challenge 1: Making sure the kids are between 9-12 years old; any younger and the physical demands of the show could be too much, any older and their bodies and voices are subject to the many changes of teenage development. Challenge 2: Putting acting and singing on the back burner at first, and making sure the level of “musicianship” of the individual is strong. Can they carry a tune? Once that is established, the production team will help to work on the additional aspects. More than anything, casting directors are looking at the personality of the child as that’s as important to them than being a “quadruple threat”. Do they love music? Are they enthusiastic and friendly with others? And more importantly, are they willing to work hard? In addition to regular rehearsals for the touring actors, cast members must also attend separate band rehearsals and tutoring lessons while on the road. Making their way to the National Arts Centre in Ottawa from September 25-30th, the SCHOOL OF ROCK cast is arriving just as Ottawa students are beginning to settle back into the daily routine of classes and homework. Because of this, we have decided to celebrate the amazing kids in our lives by having Kids Rock Broadway night on Sunday, September 30th at 7 pm. Tickets for the performance start at $40, and there will also be a number of fun props that kids can use to get that epic Rock 'N Roll photo with. Additionally, School of Rock Orleans will be hosting an instrument petting zoo. Drum kits, guitars, and basses OH MY! Kids will have a chance to check out the instruments up close, learn more about them, and get some totally jammin’ shots to add to the family photo album. What’s special about SCHOOL OF ROCK is that children in the audience can see what others their age are capable of and therefore, what they are capable of. It’s a show about the pressures of achieving perfection and the power that music and pursuing your own passions can have. Finally, it’s an exuberant reminder to children and adults to take a second out of their busy lives to have fun and let loose once in a while. For more information on show times, ticket prices and availability, check out BroadwayAcrossCanada.ca. We hope to see you there! We all grew up with LEGO® and our kids are doing the same. Which means the both the kids and the kid in you are going to love the Canada Science and Technology Museum’s brick-buster exhibition, THE ART OF THE BRICK. Named one of CNN's Top Ten "Global Must-See Exhibitions", THE ART OF THE BRICK by artist Nathan Sawaya is a critically acclaimed collection of inspiring artworks made exclusively from one of the most recognizable toys in the world: the LEGO® brick. It is literally the world’s largest display of LEGO® art, with original pieces including an immense Tyrannosaurus Rex and re-imagined versions of the world’s most famous art masterpieces, including Van Gogh’s Starry Night and Da Vinci’s Mona Lisa. The exhibit features a gallery showcasing an innovative, multimedia collection of LEGO brick infused photography produced in tandem with award-winning photographer Dean West and kid-friendly, hands-on LEGO® fun at the Brick-Party. When my daughter was younger her favourite musicians were the Canadian children’s performers Bobs & LoLo. The Vancouver-based duo caught the “ear” of my daughter when she was a toddler. Their music video for “Raindrop Pop” came on Treehouse and from that moment on, my daughter was hooked. Bobs & Lolo’s catchy songs often carry a life lesson or environmental message (I still catch myself singing “R-E-C-Y-C-L-E – Recycle, Recycle with me” when I ask my daughter to put something in the recycle bins. It comes as no surprise that Blue Skies is nominated for a 2018 Juno Children’s Album of the Year Award. 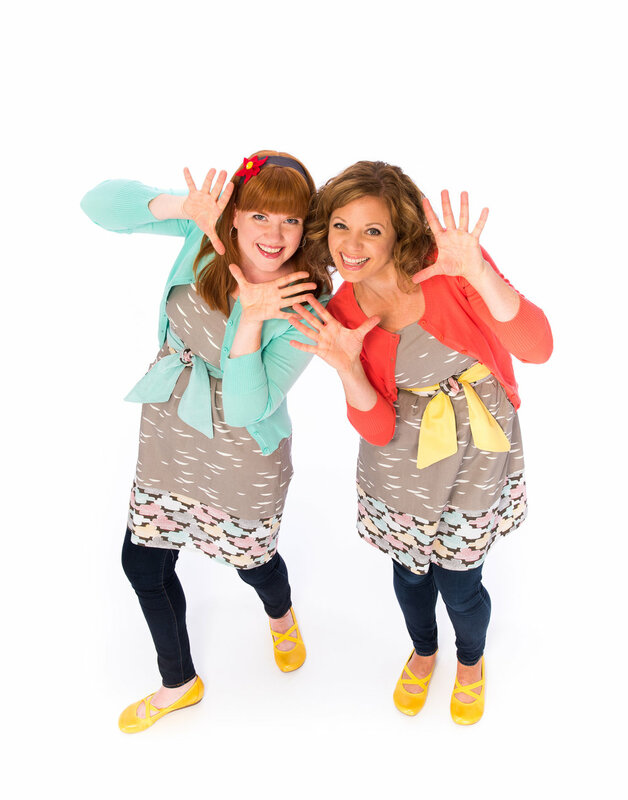 Their music is memorable, fun and is a perfect introduction into music for young kids. 1) How did you get started together? We've been Bobs & LoLo far longer than we have been songwriters, performers or business partners. We actually first met as kids at a Girl Guides camp on Vancouver Island. Years later we ended up at the same high-school where "Bobs" and "LoLo" were our childhood nicknames nearly a decade prior to becoming our stage names. 2) What made you decide to create children’s music together? The whole project evolved quite organically from our friendship and a mutual interest in music and working with kids. While we first met singing around a campfire, we later studied classical piano with the same music teacher and also sang in a choir and self-directed a cappella quartet. Before we started our musical adventures as Bobs & LoLo, Robyn (Bobs) was teaching elementary school and Lorraine (LoLo) was working in environmental education for the non-profit sector. Songwriting and live performing started out as a fun side project to create support materials for our separate jobs working with children. We never dreamed those early days would lead to running our own business, touring or national television! 3) What are the inspirations behind your newest songs? Blue Skies is probably our most personal writing project to date. We've always written songs inspired by our own childhoods and a shared love of the outdoors, nature and active living. Blue Skies definitely champions these values but we also found ourselves writing more personal pieces for our own kids, families and all of the longtime fans who have become friends over the years. This album has such a mix of influences and inspiration from family love songs like "We Love You" and "Sunshine" to upbeat kiddie-mosh tunes like "Jump With Me", "Ran To The Park" and "We Can Go Anywhere" to our signature blend of folky jazz in "Whatever the Weather" and "Scrub Scrub". We're really proud of all 14 songs on this album and hope the music and messages resonate with families everywhere. 4) Both of you have families of your own now – how do you find a balance between family and your music? Probably the biggest bonus of our industry (next to the obvious fun factor!) is that for the most part, we can include our families. Whether on tour or simply as creative inspiration, we try to bring the crew of minis along. That said, with 5 little ones between the two of us all aged 6 and under, life on the road has gotten a little more complex in recent years, but we still try to make it a family adventure whenever possible. Away from the stage, we find balance by spending time with our families in nature, weaving music and laughter into our daily lives and celebrating both parenting wins and struggles with our close network. 5) What does a typical weekday look like for you? Like all working parents, each day is pretty much a feat of multi-tasking craziness. A typical day starts with an ambitious list of what we want to get through which often includes a number of work-related items, play dates, extracurricular kiddie activities, school drop-offs and pick-ups, meal planning and subsequent grocery runs, quick walks for the dog, park play, meetings in the minivan and conference calls in the bathroom so we don't wake the babies, of course. We can also usually count on some sibling mediation, preschooler negotiations and a ridiculous amount of potty time too. The combo of parenting and professional life definitely has it’s share of challenges, but we feel fortunate to be able to do both. Some days hold big wins for work and family and some days are better left in the fog of motherhood and caffeine. 6) What is one thing fans would be surprised to know about each of you? The first thing that came to mind is that Bobs' favourite food is bacon and LoLo is a vegetarian. We're not always matchy-match! 7) What is one piece of advice you have for kids looking to get started in the music/performance industry? Success in the arts definitely takes a certain level of business acumen. This is something we learned along our journey. If there are areas that you lack expertise, ask questions, do the research, forge your path and never stop believing in yourself and the value of your creative. There have been many times in our careers where we pondered whether the personal investment was worth the return. As an artist or entrepreneur, you will always put in more hours than you might at any other job. Usually for less pay. The pay off will come. Seeing something you love and believe in thrive and grow is so incredibly rewarding. When you find something you are truly passionate about, the drive to see it succeed provides the fuel and stamina to get through the long hours and hard work. Let your light shine. It is a gift to the world and yourself! If you have never heard of Bobs & Lolo before, be sure to check them out online. You will be singing along to their music in no time! 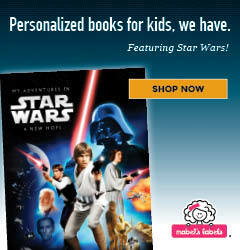 When my daughter was younger, I had a hard copy of their albums in my car and a digital copy on my iPod. They are quickly loved by young ears and I have no doubt that their music will become iconic, much like other beloved Canadian children’s performers before them. 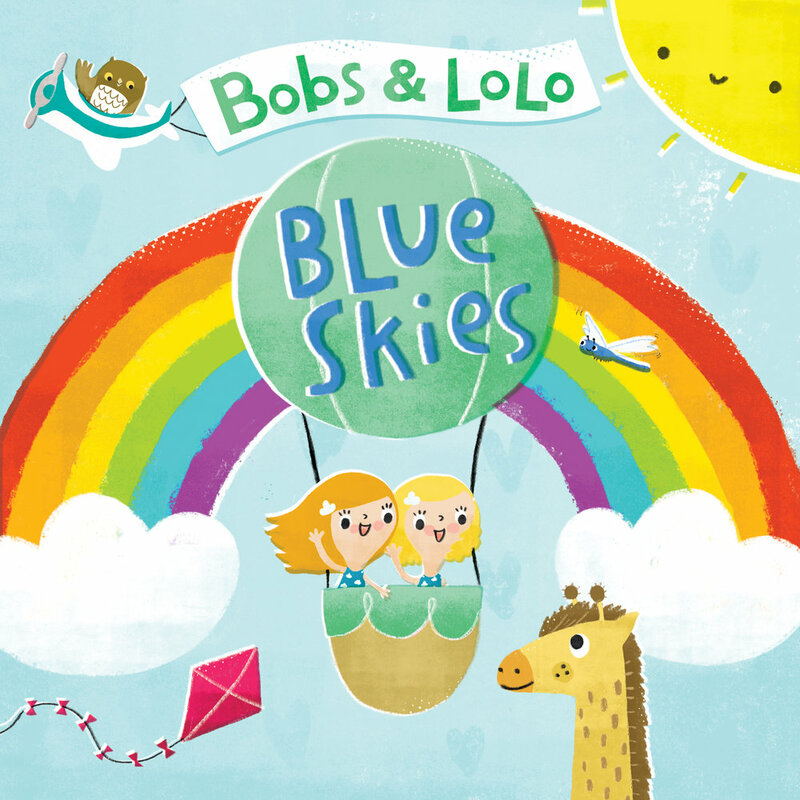 If you’re interested in getting your own copy of Bobs & LoLo’s newest album, Blue Skies, you can stream it on Spotify or purchase it on iTunes or GooglePlay. Or you can enter to win an autographed copy of Blue Skies as well as an autographed postcard! Disclosure: KITC was provided with a copy of "Blue Skies" for the purpose of this review however, as always, all thoughts and opinions are our own. As a family photographer I have no shortage of photos to display on the walls of our home. When we moved to our home three and a half years ago I was amazed at how much wall space I had to fill and yet I’m now struggling to find space to display my favourite photos of our family. I learned the hard way that framed photos aren’t necessarily the best choice for every room after a few ninja and lightsaber battles resulted in broken glass. I absolutely love printing photos on canvas but because I add so many photos to our “favourites” collection every year I need display options that allow me to switch out photos on a regular basis. I’ve also filled the available wall space which means I’m always on the lookout for creative ways to add photos to every room. Behind my computer I have a large white magnet board and a plethora of pretty magnets: I hang photos, cards I’ve received, favourite quotes, and special drawings from the kids. I like being able to change photos with the seasons without having to go through the hassle of finding or hanging frames. In 3 out of our 4 bathrooms we have photos printed on canvas. It’s a great spot for beach or vacation photos and I appreciate how durable the canvas is in the damp environment. If a canvas gets splashed it’s easy to wipe it down and I’m not worried about them falling off the walls and shattering on the file floors. I quickly learned that kid’s interests change as quickly as Canadian weather and so rather than themed bedrooms, I’ve decorated the boys rooms with their favourite photos of themselves. I chose colourful frames and canvas to hang on their walls and display on their shelves. A photo ledge is a great display option when you want to show off a collection of images without having to frame and hang them. My husband recently installed a photo ledge above our front hall closet, where I have space for 4-5 images at a time. I plan to use the space to display my seasonal photos and since I placed the photos in white mats it’s easy for me to switch out the images whenever I want. When we moved into our house I considered storing beautiful bowls and vases above our kitchen cabinets but quickly realized I had no interest in washing and cleaning them on a regular basis to keep them dust free. I’ve turned the empty space above our cabinets into display for photos and have done the same with high cabinets and dressers in other rooms. Sara McConnell is the mom to three boys and an award winning professional photographer specializing in maternity, newborn and family photography. When she's not behind her camera, drinking too much tea, in the pool or at the beach you can find her on Facebook, Instagram and on her website. Confession: we moved into our home 5 years ago, and we just got around to painting this month! The original 1980s wallpaper stuck around for so long because we've been raising two young kids - wet paint and young kids do NOT go together. So now, my darling husband has almost completed the transformation. We have a beautiful grey colour, with a slightly darker shade on our biggest wall. Grey is amazing, because you can add a lot of colour accents to your rooms. With the walls painted in such a neutral tone, we see the need for some huge splashes of colour. I've always dreamed of commissioning several pieces of art, but sadly that is not in the budget. My husband and I created a Pinterest board with all of our ideas: check it out here! Have you ever created your own wall art?